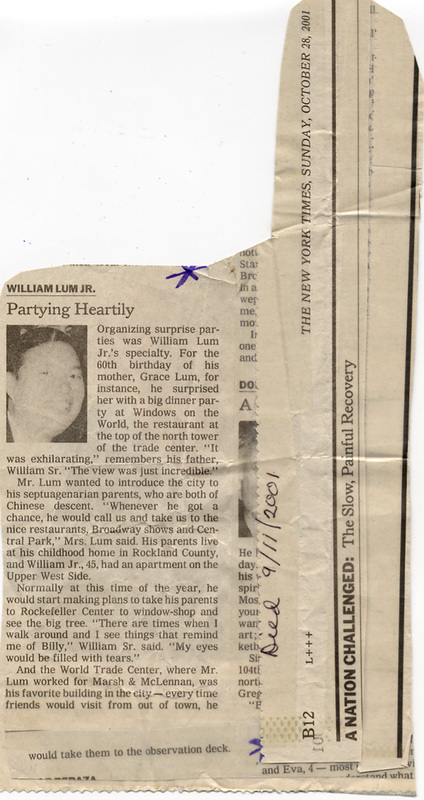 Profile of William Lum Jr., New York Times, October 28, 2001. Three days after the September 11 attacks, reporters at The New York Times, armed with stacks of the homemade missing-persons fliers that were papering the city, began dialing the numbers on the fliers, interviewing friends and relatives of the missing and writing brief portraits, or sketches, of their lives. December 31, 2001 brought the final daily edition of Portraits of Grief, but additional profiles were published from time to time. All of the profiles remain on NYTimes.com indefinitely.